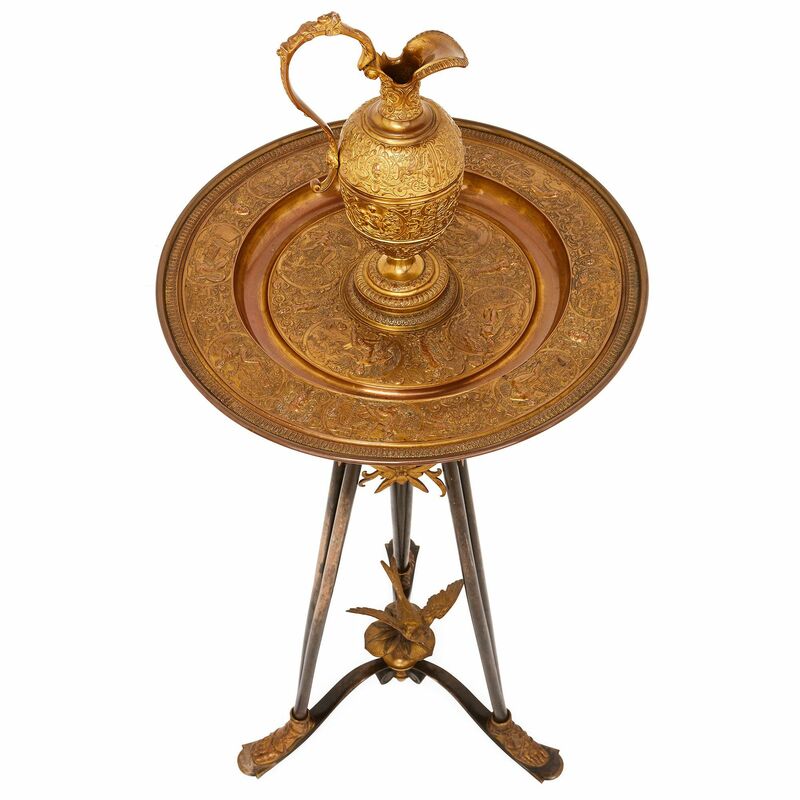 This fine, antique ewer and basin set is notable for its fine ormolu work, which could attribute it to Barbedienne, master bronzeworker of the 19th Century. 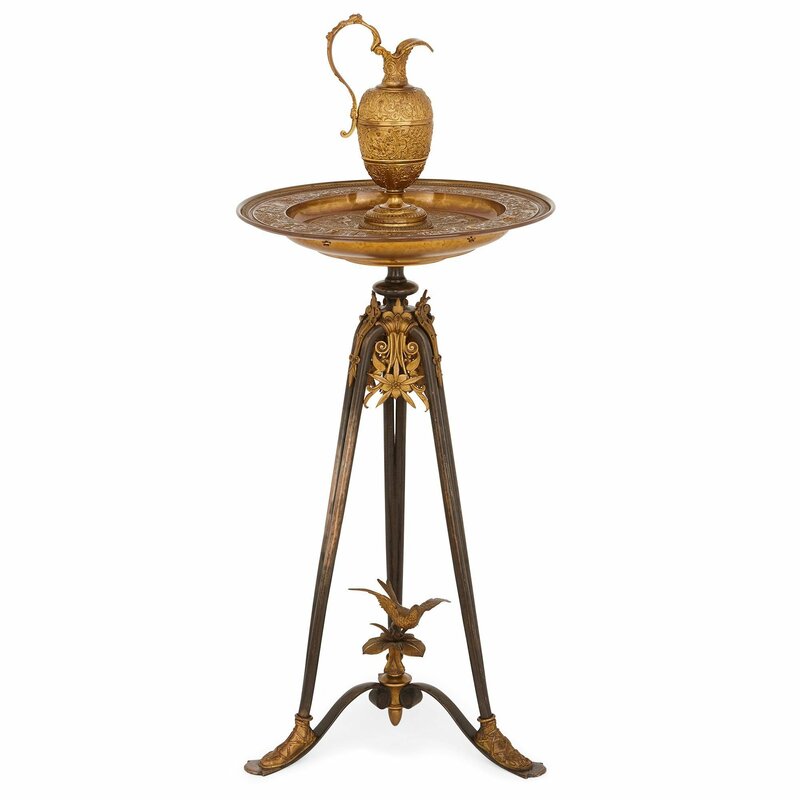 This classically inspired set comprises a ewer and accompanying basin upon a stand. The ewer is of typical form, cast entirely in ormolu and features an ovoid body with a stepped, waisted base and neck with a singular scrolled handle and a pouring spout. 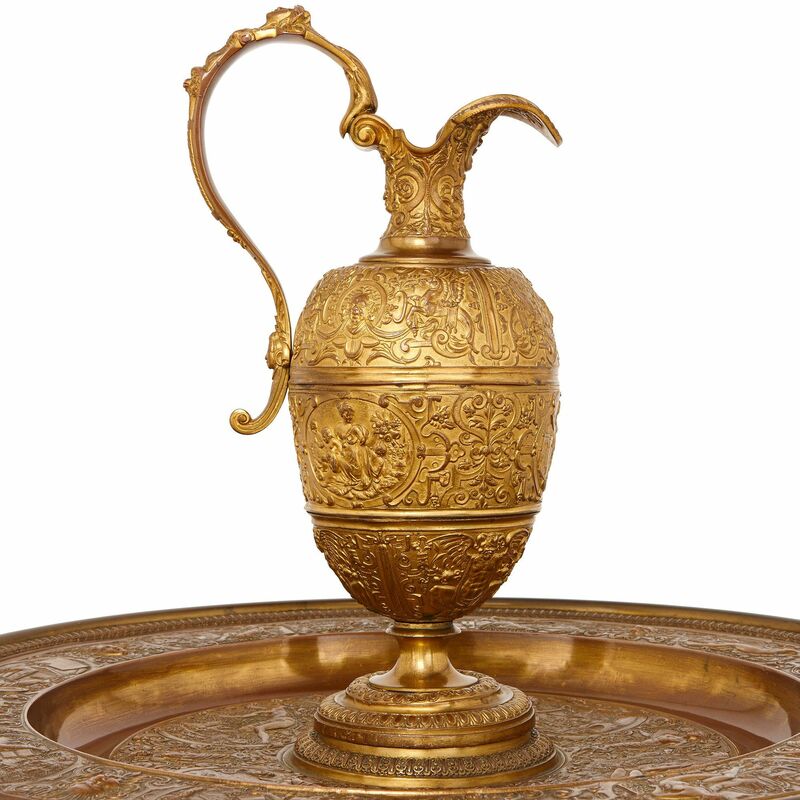 The ewer is worked in the repousse technique, decorated with classical scenes and scrolling arabesques all over. 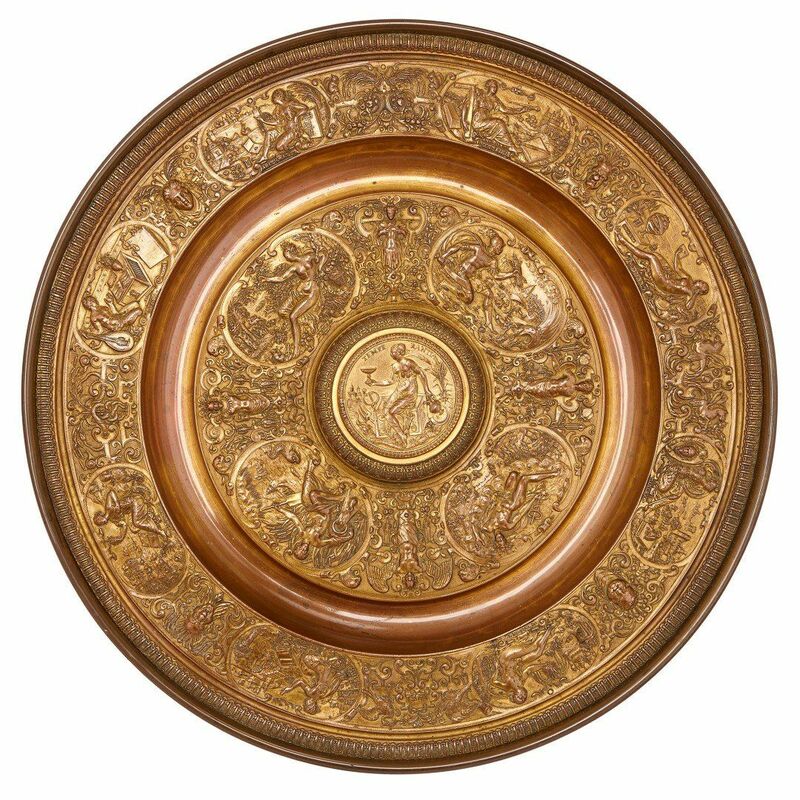 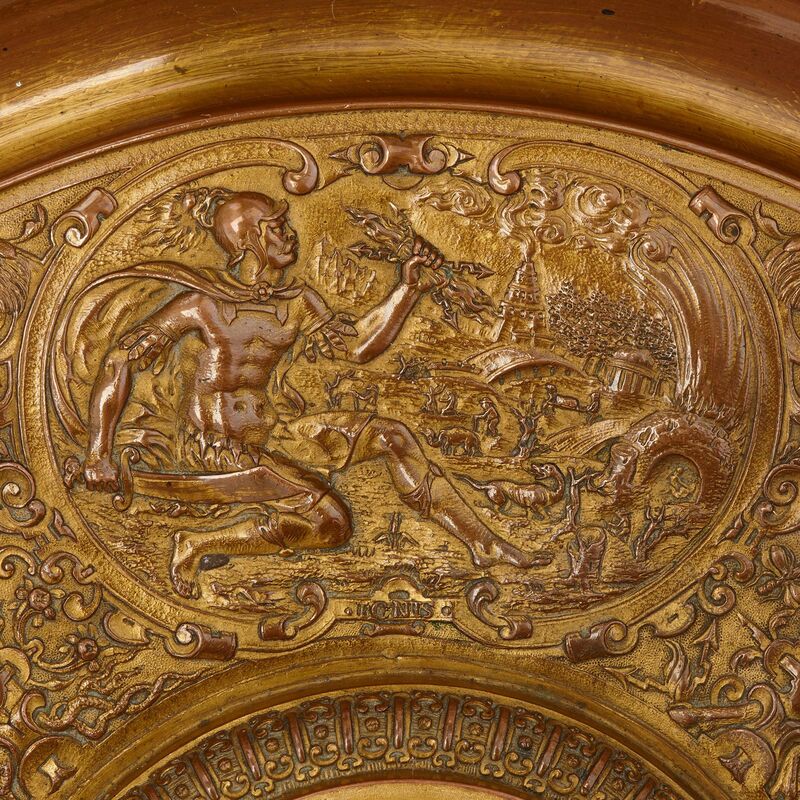 The stand is surmounted by a circular, ormolu basin, which takes the form of a large platter. 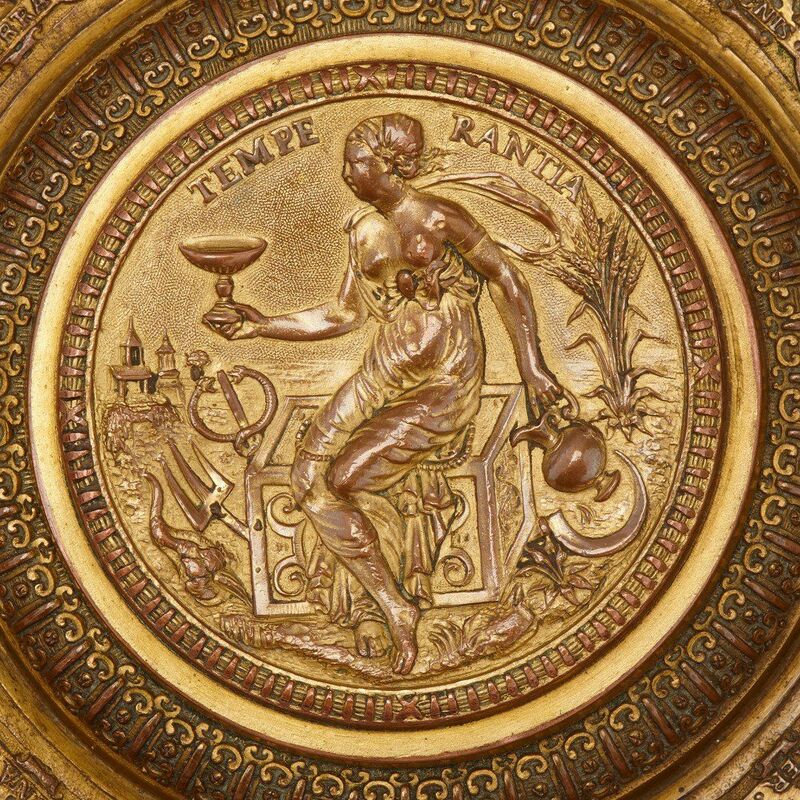 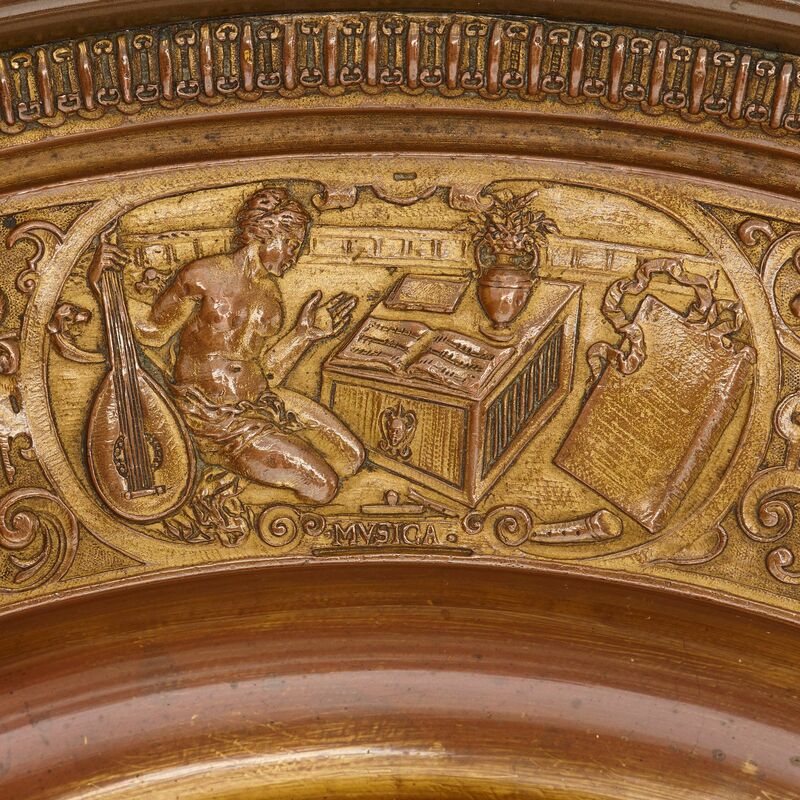 The basin is decorated to the centre with the depiction of a classical woman holding a ewer and a basin which is inscribed with 'Tempe Rantia' which is the Latin for 'moderation' or 'self-control'. 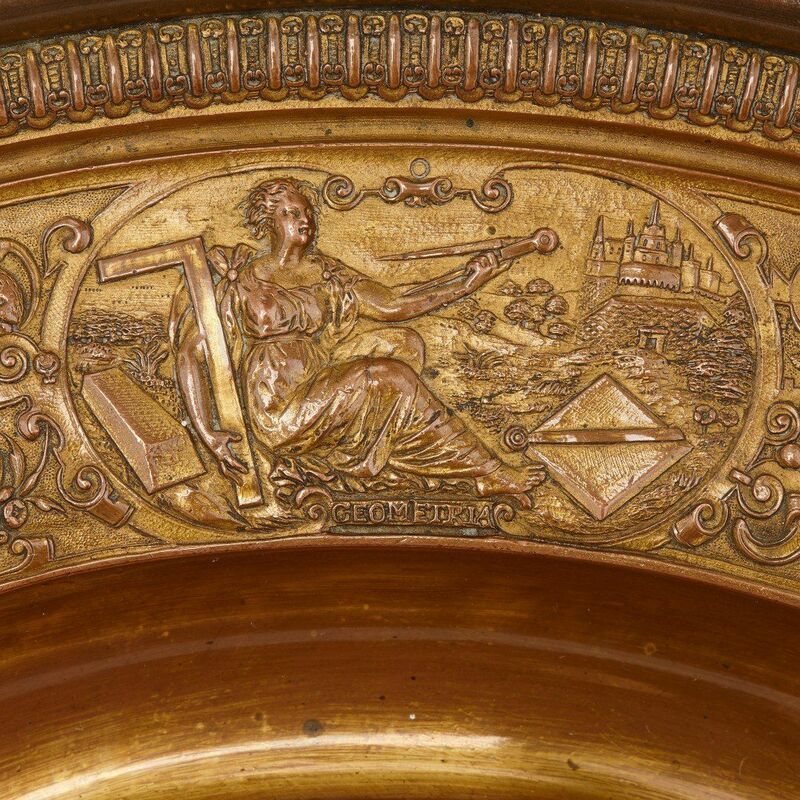 Encircling the central image are depictions of the four elements: Water, Air, Fire and Earth, with the outer rim featuring depictions of the humanities and scientific disciplines: Music, Arithmetic, Geometry, Astrology, Grammar, Rhetoric, Logic and Knowledge, as represented by the goddess Minerva. 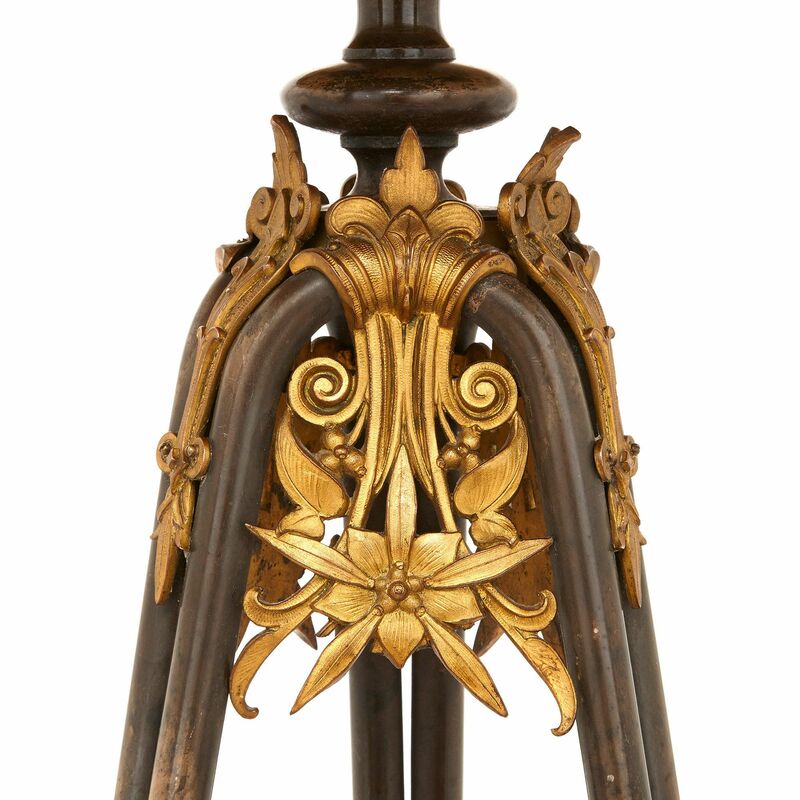 The basin is set upon a patinated bronze tri-form stand which is mounted with ormolu scrolls and flowers to the top, and features joining stretchers to the base which meet in the centre. 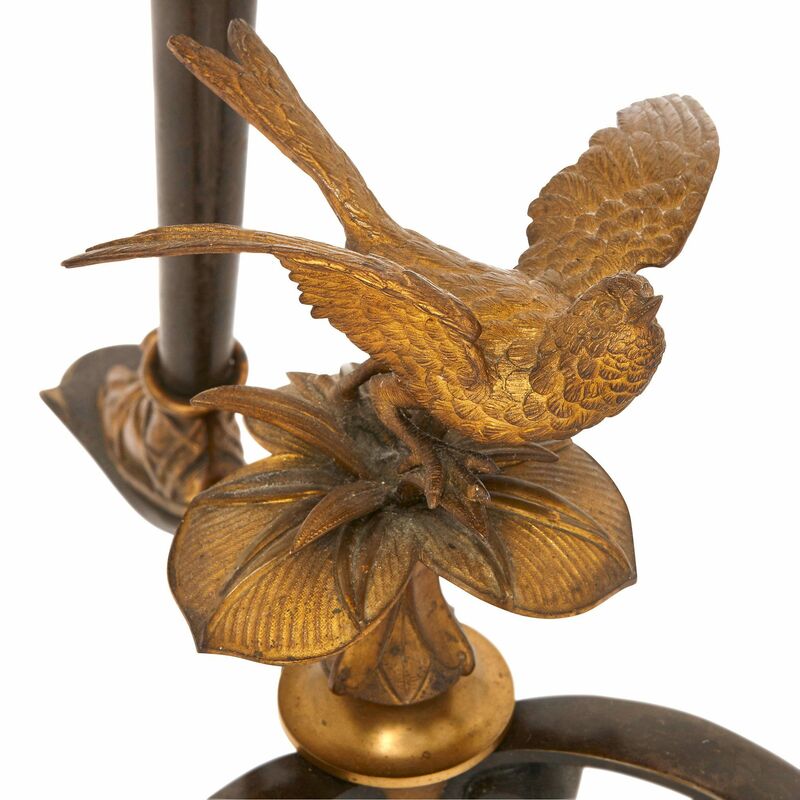 The centre of the base is mounted with an ormolu bird perching on leaves. 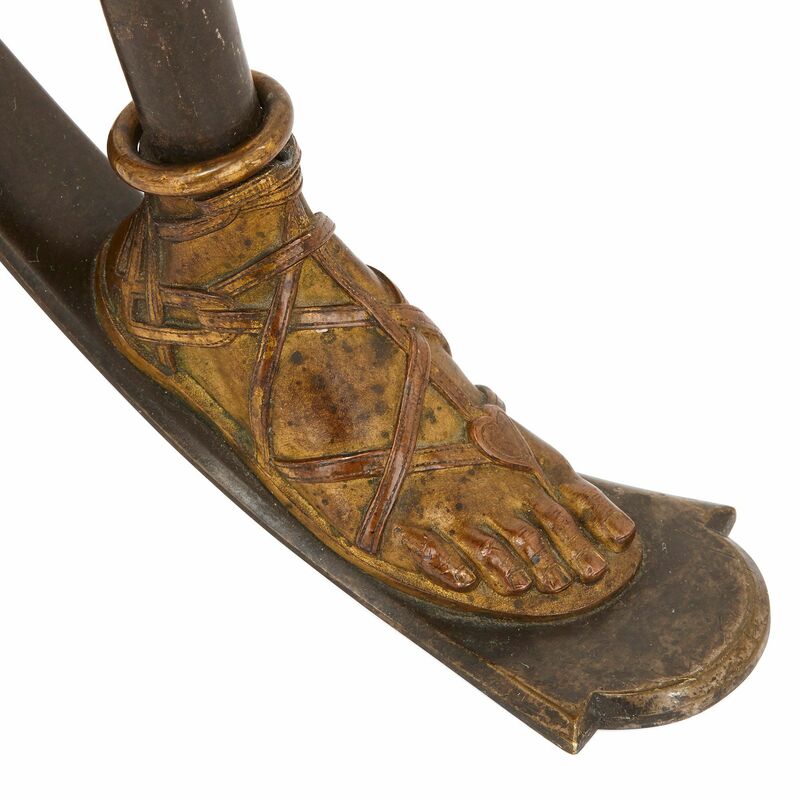 The three legs stand on ormolu mounts in the form of human feet wearing sandals.